I am not much of a gamer unless you count Lego games on the Wii? My sister and I have spent many an hour playing Lego Harry Potter, Indiana Jones and Star Wars. However, for the more intense gamer there is quite a selection here at the library. We have several hundred games for seven different systems (Wii, WiiU, Nintendo Switch, Xbox 360, Xbox One, PS3 and PS4). If you are interested in checking out a game it just requires a library card. Each patron can check out two games per card for a week each time. First line: It’s too damn cold of a day to be out on a hunt. 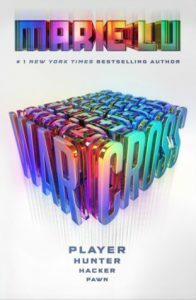 Summary: Everyone plays Warcross, the virtual reality game invented by a fourteen year old boy, Hideo Tanaka. It is a global sensation. When Emika Chen, a struggling bounty hunter, glitches into the Opening Ceremonies for the annual Warcross games she becomes an instant sensation. She is invited to come to Tokyo. Fearful that she is going to be arrested for tampering with the game she is surprised to learn that the game’s inventor wants to hire her to find the person who has been threatening to bring down the game and himself. What appears to be a normal bounty hunt becomes much more when Emika is chosen to be one of the players in the championship games. Highlights: I really enjoy Lu’s writing style. It is simple but fast paced. I recently watched the movie, Ready Player One, and was surprised how much I liked it. I found this to be very similar in themes and feel. The idea of having these virtual reality worlds is amazing but does not seem like it will be too far in the future. I would love to be able to feel like I am in another world even though I am sitting at home on the couch. How cool is that? I always dreamed of having a holodeck, like on Star Trek. I want to live inside my books and virtual reality appears to be a solution for this. Emika is a fun character to follow. She is intelligent, determined and resourceful. She has a funny side as well. When she meets Hideo she is shy but handles it well, even throwing out a few jokes. Even the romance is very nicely done. Emika has a followed Tanaka’s career since he became a global superstar. Their scenes together were always fun and filled with romantic tension. So cute! I like that Lu has a very diverse cast of characters. Hopefully we will get to know her fellow team mates in the next book. One character I hope we get lots more of is Tremaine. He has several key moments in the book but at the end we learn more about him and his role in everything. I already have book two, Wildcard, on my desk. I am itching to start reading it and see where Lu takes us next! Lowlights: Several of the twists were a little predictable. However, with Lu’s writing and the pacing of the novel it can be easily overlooked. I thoroughly enjoyed reading/listening to this story and would highly recommend it. FYI: Check out Lu’s other series, Legend, and her standalone novel about Bruce Wayne (a.k.a. Batman), Batman: Nightwalker.